This special kit comes with everything you need to start shooting right away! 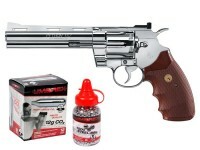 The Colt Python is one of the most desired firearm revolvers, and now you can have it as a CO2 BB gun. When you pick it up, you'll swear you're holding the real steel. The working ejector rod, the realistic cartridge shells, the full barrel underlug and swing-out cylinder really drive home the fidelity to the firearm. 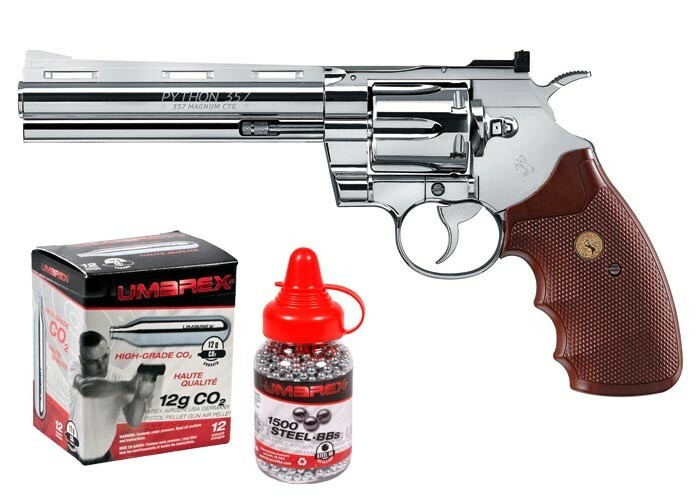 Known by many as the "Rolls Royce of Colt revolvers" and "the best revolver in the world," the Colt Python becomes a remarkably affordable revolver in it's BB gun incarnation. 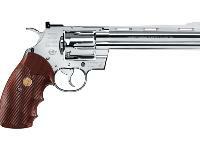 This revolver is compatible with Dan Wesson BB revolver shells, however you'll notice a drop in velocity due to the smaller size of the Dan Wesson shells. Things I liked: Good weight and feel of original and safety hidden in frame. Things I liked: I loved the chrome look. A shiny silver gun is an awesome gun. Things I would have changed: I did not like the grip at all. It's made of hard plastic that seemed cheap. It didn't feel like it had any grip at all would be nice if they made it out of polymer like the DW 715. What others should know: I'm not sure if mine was just flawed but the hammer that came along with it was a bit crooked, didn't seem to effect the gun too much though, I just hope later on it won't cause me any issues. 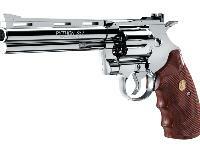 Overall a pretty solid gun if you want to have a nice chrome python for collection. Things I liked: This was I thought a pretty good offer as I am new to air gunning, and I thought the revolver looked really "REAL," and does in real life viewing. It is hefty like a real Python would be and just about everything is just so realistic. Plus the price was very reasonable, it just seemed to hard to pass by, especially when you add in the inclusion of the pellets and CO2 gas. I just thought it was a great deal!! Things I would have changed: Really, being as new to air gunning as I am, I really don't have enough experience in all this stuff to make all that much of a really good call on what's all that good or what might be bad. What others should know: No re-ply to this question. Can this pistol shoot pellets?